A small farm in a dominant position with an incredible view. The bedrooms being in the old buildings. Not only outstanding country side but also fine food and walks with our donkeys. Very close to the magnificient "Bastides" of Villeneuve and Villefranche and plenty of other interesting places to visit. 2 charmingly decorated bedrooms are available, "The intimate little bergerie or Sheep Shed" is for 2 people. 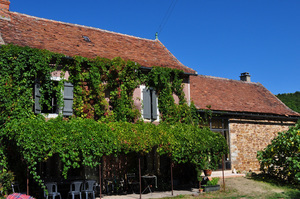 The other one "la Vigneronne or Lady wine producer" is for 4/5 people, so ideal for a family. The 2 are completely separate and are equiped with a show lavatory and wash-bassin. "The studio 9", also beautifully decorated opens onto the winter garden and downstairs consists of a kitchenette, bathrooms and a lounge area with a comfortable sofa-bed and above is a mezzanine with a double bed. Thanks, your message has been sent!